Pheochromocytoma is a rare catecholamine-secreting tumor that arises from chromaffin cells of the sympathetic nervous system (adrenal medulla or and sympathetic chain); however, the tumor may develop anywhere in the body "catecholamine-secreting paragangliomas" ("extraadrenal pheochromocytomas"). 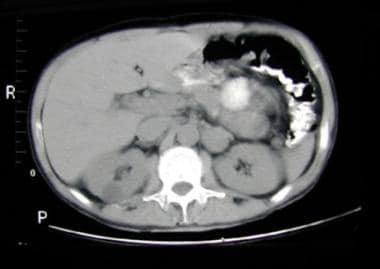 The term paraganglioma refers to any extra-adrenal or nonfunctional tumor of the paraganglion system, whereas functional tumors are referred to as extra-adrenal pheochromocytomas. Pheochromocytomas and catecholamine-secreting paragangliomas have a similar clinical presentation, but the risk for associated neoplasms, risk for malignancy, and genetic testing is different between the tumors. Release of catecholamines into the circulation by these tumors causes significant hypertension. The classic clinical presentation includes paroxysmal attacks of headaches, pallor, palpitations, and diaphoresis. Pheochromocytomas occur in both children and adults. In children, pheochromocytoma is more frequently associated with other familial syndromes, such as neurofibromatosis, von Hippel-Lindau disease, tuberous sclerosis, Sturge-Weber syndrome, and as a component of multiple endocrine neoplasia (MEN) syndromes (MEN 2A, MEN 2B). Familial cases are often bilateral or multicentric within an individual adrenal gland. Adrenal pheochromocytomas are most often found on the right side and are sporadic, unilateral, and intra-adrenal. Approximately 6-10% of the tumors are malignant. Early diagnosis is important because the tumor may be fatal if undiagnosed, especially in pregnant women during delivery or in patients undergoing surgery for other disorders. Diagnosis can be made based on elevated levels of urinary catecholamines, but localization may require various modalities (see the images below, as well as Workup). 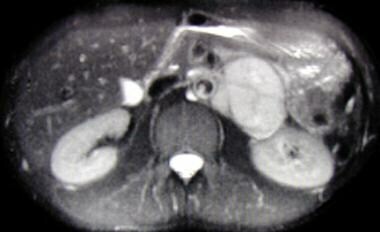 Axial, T2-weighted MRI scan showing large left suprarenal mass of high signal intensity on a T2-weighted image. The mass is a pheochromocytoma. Abdominal CT scan demonstrating left suprarenal mass of soft tissue attenuation representing a paraganglioma. For a discussion of pheochromocytoma in adults, see the Medscape Reference article Pheochromocytoma. Pheochromocytoma is a tumor of neuroendocrine origin. In the fifth week of fetal development, neuroblastic cells migrate from the thoracic neural crest to form the sympathetic chains and preaortic ganglia. These cells are believed to be the precursors of neuroblastomas and ganglioneuromas. The pathophysiology of the pheochromocytoma is best appreciated with an understanding of catecholamine biochemistry. The biosynthesis and storage of catecholamines in chromaffin cell tumors may differ from the biosynthesis and storage in the normal medulla. However, the granules are morphologically and functionally similar to the granules from the adrenal medulla. The increase in tissue turnover suggests an alteration in the regulation of the catecholamine biosynthesis and possibly suggests an alteration in the feedback inhibition of tyrosine hydroxylase, the key enzyme in the production of catecholamines. The actions of catecholamines are mediated by the alpha-adrenergic and beta-adrenergic receptors. Alpha1 receptors cause arteriolar constriction. Alpha2 receptors mediate the presynaptic feedback inhibition of norepinephrine release and decrease insulin secretion. Beta1 receptors increase cardiac rate and contractility. Beta2 receptors cause arteriolar and venous dilation and relaxation of tracheobronchial smooth muscle. The symptoms associated with pheochromocytomas are caused by the physiologic and pharmacologic effects of large amounts of circulating norepinephrine and epinephrine. Pheochromocytoma is inducible in rats by various nongenotoxic substances that may act indirectly by stimulating chromaffin cell proliferation. The nerve growth factor-responsive PC12 cell line, established from a rat pheochromocytoma, has served as a research tool for almost 30 years for many aspects of neurobiology involving normal and neoplastic conditions. Pheochromocytoma cell lines from neurofibromatosis knockout mice supplement the PC12 line and have generated additional applications. Two mice models of metastatic pheochromocytoma have been established: one used tail vein injection of mouse pheochromocytoma cells  ; the other involved the conditional knockout of the pten protein. Thus, the use of mouse models allows further study into the pathogenesis of human malignant pheochromocytoma and into therapeutic strategies for these tumors. Bone lesions have been described following changes in the microcirculation. Myocarditis characterized by focal degeneration and necrosis of myocardial fibers with infiltration of histiocytes, plasma cells, and other signs of inflammation may be present. Chronic constriction of the arterial and venous beds leads to a reduction in plasma volume. The inability to further constrict the bed upon arising results in postural hypotension. Pheochromocytoma occurs wherever chromaffin tissue is found. Mutations in genes that code for 3 of the 4 components of mitochondrial complex II can cause paragangliomas and pheochromocytomas. The 3 genes involved are SDHB, SDHC, and SDHD. Of the 4 components of mitochondrial complex II (succinate dehydrogenase [SDH] A, B, C, and D), SDHC and SDHD anchor the catalytic subunits SDHA and SDHB in the inner mitochondrial membrane. SDHD is maternally imprinted, whereas SDHB and SDHC are not. Although SDHD and, to a lesser degree, SDHB mutations have been found in many cases of hereditary paragangliomas, SDHC mutations are rare. Amar et al delineated causes of pheochromocytoma in a study of 314 patients with pheochromocytoma or functional paraganglioma. Fifty six patients had family history, syndromic disease, or both, and 258 patients had sporadic presentation. Among the 56 patients with a family history, syndromic presentation, or both, 13 had neurofibromatosis type 1, and 43 had germline mutations on the VHL, RET, SDHD, or SDHB genes (16, 15, 9, and 3 patients, respectively). Only 11% of the patients with sporadic disease had a germline mutation (18 patients had a SDHB mutation, 9 patients had a VHL mutation, 2 patients had a SDHD mutation, and 1 patient had a RET mutation). Mutation carriers were young and frequently had bilateral or extra-adrenal tumors. In patients with an SDHB mutation, the tumors were larger, usually extra-adrenal, and malignant. Pheochromocytomas are usually sporadic, but they may be familial and appear as a component of other syndromes, such as MEN 2A (medullary thyroid carcinoma, parathyroid hyperplasia, pheochromocytoma). Germline mutations of the ret proto-oncogene on chromosome 10 (10q11.2) have been found in families with MEN 2A and MEN 2B (medullary thyroid carcinoma, neuromas, pheochromocytoma). In von Hippel-Lindau syndrome, specific mutations determine the varied clinical manifestations, which, in addition to pheochromocytomas, include retinal angiomas; cerebellar hemangioblastomas; and renal, pancreatic, and epididymal tumors. A germline mutation in a tumor suppressor gene on chromosome 3 has been identified. Pheochromocytoma is also associated with tuberous sclerosis, Sturge-Weber syndrome, and ataxia-telangiectasia. In the United States, the reported annual incidence rate of pheochromocytomas is approximately 1 per 100,000 population, with 10-20% of cases occurring in children or adolescents. The frequency of bilateral tumors is higher in children than in adults (20% vs 5-10%), while that of malignant tumors is lower (3.5% vs 3-14%). More than one third of affected children have multiple tumors, most of which are recurrent. In children, 70% of cases are unilateral, 70% of cases are confined to adrenal locations, and an increased association with familial syndromes is noted. In 30-40% of children with pheochromocytomas, tumors are found in both adrenal and extra-adrenal areas or in only extra-adrenal areas. Pheochromocytomas have been described in Japanese, Chinese, black, European, and white families. No geographic predilection is known. The prognosis in patients with pheochromocytomas appears to be related to tumor size, degree of uncontrolled hypertension, and the presence of metastatic disease. Special consideration must be given to prepare these patients for surgery, because dramatic blood pressure swings may be observed. Malignant pheochromocytomas, which are rare in children, are locally invasive and may spread to distant areas that do not contain chromaffin cells, including the liver, lung, bone, and lymph nodes. The mean 5-year survival rate in patients with malignant pheochromocytomas is 40%. A study by Khorram-Manesh et al of the long-term outcome in Swedish patients who underwent surgical treatment of pheochromocytoma from 1950-1997 found that over 15 (±6) years, 42 patients died, compared with 23.6 deaths expected in the general population. Besides older age at primary surgery, elevated urinary excretion of methoxy-catecholamines was the only observed mortality risk factor. Preoperative and postoperative hypertension did not influence the mortality risk compared with controls. A retrospective study by Timmers et al in the Netherlands documented that metastases, but not cardiovascular mortality, reduced life expectancy in 69 patients who had undergone surgical resection of apparently benign pheochromocytoma. Kaplan-Meier estimates for 5-year and 10-year survival since surgery were 85.8% and 74.2% for patients compared with 95.5% and 89.4% in the reference population. Waguespack SG, Rich T, Grubbs E, et al. A current review of the etiology, diagnosis, and treatment of pediatric pheochromocytoma and paraganglioma. J Clin Endocrinol Metab. 2010 May. 95(5):2023-37. [Medline]. Eisenhofer G, Huynh TT, Elkahloun A, Morris JC, Bratslavsky G, Linehan WM. Differential expression of the regulated catecholamine secretory pathway in different hereditary forms of pheochromocytoma. Am J Physiol Endocrinol Metab. 2008 Nov. 295(5):E1223-33. [Medline]. [Full Text]. Korpershoek E, Pacak K, Martiniova L. Murine models and cell lines for the investigation of pheochromocytoma: applications for future therapies?. Endocr Pathol. 2012 Mar. 23(1):43-54. [Medline]. [Full Text]. Tischler AS, Powers JF, Alroy J. Animal models of pheochromocytoma. Histol Histopathol. 2004 Jul. 19(3):883-95. [Medline]. Martiniova L, Lai EW, Elkahloun AG, Abu-Asab M, Wickremasinghe A, Solis DC. Characterization of an animal model of aggressive metastatic pheochromocytoma linked to a specific gene signature. Clin Exp Metastasis. 2009. 26(3):239-50. [Medline]. Korpershoek E, Loonen AJ, Corvers S, van Nederveen FH, Jonkers J, Ma X. Conditional Pten knock-out mice: a model for metastatic phaeochromocytoma. J Pathol. 2009 Mar. 217(4):597-604. [Medline]. Amar L, Bertherat J, Baudin E, et al. Genetic testing in pheochromocytoma or functional paraganglioma. J Clin Oncol. 2005 Dec 1. 23(34):8812-8. [Medline]. Lai EW, Perera SM, Havekes B, Timmers HJ, Brouwers FM, McElroy B. Gender-related differences in the clinical presentation of malignant and benign pheochromocytoma. Endocrine. 2008 Aug-Dec. 34(1-3):96-100. [Medline]. Zelinka T, Musil Z, Dušková J, et al. Metastatic pheochromocytoma: Does the size and age matter?. Eur J Clin Invest. 2011 Oct. 41(10):1121-1128. [Medline]. [Full Text]. Khorram-Manesh A, Ahlman H, Nilsson O, et al. Long-term outcome of a large series of patients surgically treated for pheochromocytoma. J Intern Med. 2005 Jul. 258(1):55-66. [Medline]. Timmers HJ, Brouwers FM, Hermus AR, Sweep FC, Verhofstad AA, Verbeek AL, et al. Metastases but not cardiovascular mortality reduces life expectancy following surgical resection of apparently benign pheochromocytoma. Endocr Relat Cancer. 2008 Dec. 15(4):1127-33. [Medline]. Prejbisz A, Lenders JW, Eisenhofer G, Januszewicz A. Mortality associated with phaeochromocytoma. Horm Metab Res. 2013 Feb. 45(2):154-8. [Medline]. Mannelli M, Lenders JW, Pacak K, Parenti G, Eisenhofer G. Subclinical phaeochromocytoma. Best Pract Res Clin Endocrinol Metab. 2012 Aug. 26(4):507-15. [Medline]. [Full Text]. Prejbisz A, Lenders JW, Eisenhofer G, Januszewicz A. Cardiovascular manifestations of phaeochromocytoma. J Hypertens. 2011 Aug 5. [Medline]. Yu R, Nissen NN, Chopra P, Dhall D, Phillips E, Wei M. Diagnosis and treatment of pheochromocytoma in an academic hospital from 1997 to 2007. Am J Med. 2009 Jan. 122(1):85-95. [Medline]. Zeiger MA, Siegelman SS, Hamrahian AH. Medical and surgical evaluation and treatment of adrenal incidentalomas. J Clin Endocrinol Metab. 2011 Jul. 96(7):2004-15. [Medline]. Pamporaki C, Därr R, Bursztyn M, et al. Plasma-free vs deconjugated metanephrines for diagnosis of phaeochromocytoma. Clin Endocrinol (Oxf). 2013 Mar 5. [Medline]. Hickman PE, Leong M, Chang J, Wilson SR, McWhinney B. Plasma free metanephrines are superior to urine and plasma catecholamines and urine catecholamine metabolites for the investigation of phaeochromocytoma. Pathology. 2009 Feb. 41(2):173-7. [Medline]. Boyle JG, Davidson DF, Perry CG, Connell JM. Comparison of diagnostic accuracy of urinary free metanephrines, vanillyl mandelic Acid, and catecholamines and plasma catecholamines for diagnosis of pheochromocytoma. J Clin Endocrinol Metab. 2007 Dec. 92(12):4602-8. [Medline]. Giovanella L, Ceriani L, Balerna M, Keller F, Taborelli M, Marone C, et al. Diagnostic value of serum chromogranin-A combined with MIBG scintigraphy inpatients with adrenal incidentalomas. Q J Nucl Med Mol Imaging. 2008 Mar. 52(1):84-88. [Medline]. Imani F, Agopian VG, Auerbach MS, Walter MA, Imani F, Benz MR. 18F-FDOPA PET and PET/CT accurately localize pheochromocytomas. J Nucl Med. 2009 Apr. 50(4):513-9. [Medline]. Fiebrich HB, Brouwers AH, van Bergeijk L, van den Berg G. Image in endocrinology. Localization of an adrenocorticotropin-producing pheochromocytoma using 18F-dihydroxyphenylalanine positron emission tomography. J Clin Endocrinol Metab. 2009 Mar. 94(3):748-9. [Medline]. Kauhanen S, Seppanen M, Ovaska J, Minn H, Bergman J, Korsoff P. The clinical value of [18F]fluoro-dihydroxyphenylalanine positron emission tomography in primary diagnosis, staging, and restaging of neuroendocrine tumors. Endocr Relat Cancer. 2009 Mar. 16(1):255-65. [Medline]. Zelinka T, Timmers HJ, Kozupa A, et al. Role of positron emission tomography and bone scintigraphy in the evaluation of bone involvement in metastatic pheochromocytoma and paraganglioma: specific implications for succinate dehydrogenase enzyme subunit B gene mutations. Endocr Relat Cancer. 2008 Mar. 15(1):311-23. [Medline]. Lenders JW, Duh QY, Eisenhofer G, Gimenez-Roqueplo AP, Grebe SK, Murad MH, et al. Pheochromocytoma and paraganglioma: an endocrine society clinical practice guideline. J Clin Endocrinol Metab. 2014 Jun. 99 (6):1915-42. [Medline]. Brandi ML, Gagel RF, Angeli A, et al. Guidelines for diagnosis and therapy of MEN type 1 and type 2. J Clin Endocrinol Metab. 2001 Dec. 86 (12):5658-71. [Medline]. Wells SA Jr, Asa SL, Dralle H, et al. Revised American Thyroid Association guidelines for the management of medullary thyroid carcinoma. Thyroid. 2015 Jun. 25 (6):567-610. [Medline]. Dannenberg H, van Nederveen FH, Abbou M, et al. Clinical characteristics of pheochromocytoma patients with germline mutations in SDHD. J Clin Oncol. 2005 Mar 20. 23(9):1894-901. [Medline]. Erlic Z, Neumann HP. When should genetic testing be obtained in a patient with phaeochromocytoma or paraganglioma?. Clin Endocrinol (Oxf). 2009 Mar. 70(3):354-7. [Medline]. Jimenez C, Cote G, Arnold A, Gagel RF. Should Patients with Apparently Sporadic Pheochromocytomas or Paragangliomas be Screened for Hereditary Syndromes?. J Clin Endocrinol Metab. 2006 May 30. [Medline]. [Full Text]. Neumann HP, Bausch B, McWhinney SR, et al. Germ-line mutations in nonsyndromic pheochromocytoma. N Engl J Med. 2002 May 9. 346(19):1459-66. [Medline]. Neumann HP, Bausch B, McWhinney SR, et al. Germ-line mutations in nonsyndromic pheochromocytoma. N Engl J Med. 2002 May 9. 346 (19):1459-66. [Medline]. Currás-Freixes M, Inglada-Pérez L, Mancikova V, et al. Recommendations for somatic and germline genetic testing of single pheochromocytoma and paraganglioma based on findings from a series of 329 patients. J Med Genet. 2015 Aug 12. [Medline]. Brouwers FM, Petricoin EF 3rd, Ksinantova L, Breza J, Rajapakse V, Ross S, et al. Low molecular weight proteomic information distinguishes metastatic from benign pheochromocytoma. Endocr Relat Cancer. 2005 Jun. 12(2):263-72. [Medline]. Suh I, Shibru D, Eisenhofer G, Pacak K, Duh QY, Clark OH, et al. Candidate genes associated with malignant pheochromocytomas by genome-wide expression profiling. Ann Surg. 2009 Dec. 250(6):983-90. [Medline]. Brouwers FM, Elkahloun AG, Munson PJ, et al. Gene expression profiling of benign and malignant pheochromocytoma. Ann N Y Acad Sci. 2006 Aug. 1073:541-56. [Medline]. Rattenberry E, Vialard L, Yeung A, et al. A comprehensive next generation sequencing based genetic testing strategy to improve diagnosis of inherited pheochromocytoma and paraganglioma. J Clin Endocrinol Metab. 2013 May 10. [Medline]. Gosse P, Tauzin-Fin P, Sesay MB, Sautereau A, Ballanger P. Preparation for surgery of phaeochromocytoma by blockade of alpha-adrenergic receptors with urapidil: what dose?. J Hum Hypertens. 2009 Sep. 23(9):605-9. [Medline]. Shonkwiler RJ, Lee JA. Laparoscopic retroperitoneal adrenalectomy. Surg Laparosc Endosc Percutan Tech. 2011 Aug. 21(4):243-7. [Medline]. [Guideline] International Pediatric Endosurgery Group. IPEG guidelines for the surgical treatment of adrenal masses in children. J Laparoendosc Adv Surg Tech A. 2010 Mar. 20(2):vii-ix. [Medline]. St Peter SD, Valusek PA, Hill S, et al. Laparoscopic adrenalectomy in children: a multicenter experience. J Laparoendosc Adv Surg Tech A. 2011 Sep. 21(7):647-9. [Medline]. Huang H, Abraham J, Hung E, Averbuch S, Merino M, Steinberg SM. Treatment of malignant pheochromocytoma/paraganglioma with cyclophosphamide, vincristine, and dacarbazine: recommendation from a 22-year follow-up of 18 patients. Cancer. 2008 Oct 15. 113(8):2020-8. [Medline]. Joshua AM, Ezzat S, Asa SL, Evans A, Broom R, Freeman M. Rationale and evidence for sunitinib in the treatment of malignant paraganglioma/pheochromocytoma. J Clin Endocrinol Metab. 2009 Jan. 94(1):5-9. [Medline]. Park KS, Lee JL, Ahn H, Koh JM, Park I, Choi JS. Sunitinib, a novel therapy for anthracycline- and cisplatin-refractory malignant pheochromocytoma. Jpn J Clin Oncol. 2009 May. 39(5):327-31. [Medline]. Jimenez C, Cabanillas ME, Santarpia L, Jonasch E, Kyle KL, Lano EA. Use of the tyrosine kinase inhibitor sunitinib in a patient with von Hippel-Lindau disease: targeting angiogenic factors in pheochromocytoma and other von Hippel-Lindau disease-related tumors. J Clin Endocrinol Metab. 2009 Feb. 94(2):386-91. [Medline]. Jimenez C, Rohren E, Habra MA, et al. Current and Future Treatments for Malignant Pheochromocytoma and Sympathetic Paraganglioma. Curr Oncol Rep. 2013 May 15. [Medline].